Don 't you wish you had a tree like this in your front yard? 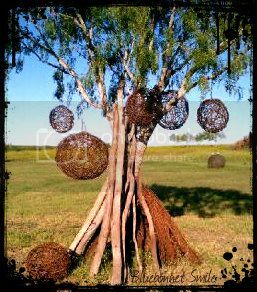 These barbed wire balls will be ready for you to take home with you from the Barn Sale in Gonzales on November 2 and 3. Imagine them with twinkle lights. Thanks, Tracy we are sooooo excited! The wonderful maker of the balls said we have about 9 as of the 30th so come early. Stack 3 and cover in white twinkle lights for a great Snowman this Christmas!